Rhiannon and instructor Elsa at the end of the three-day workshop. Indigo hands! 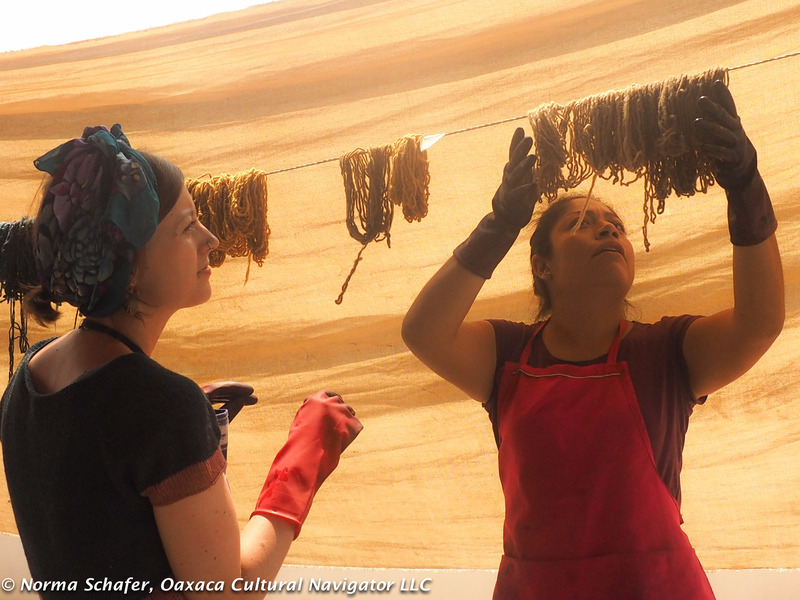 The third and last day of the three-day Oaxaca Natural Dye Workshop brings together all the preparation of the first two days in a culminating extravaganza of rich, deep color. 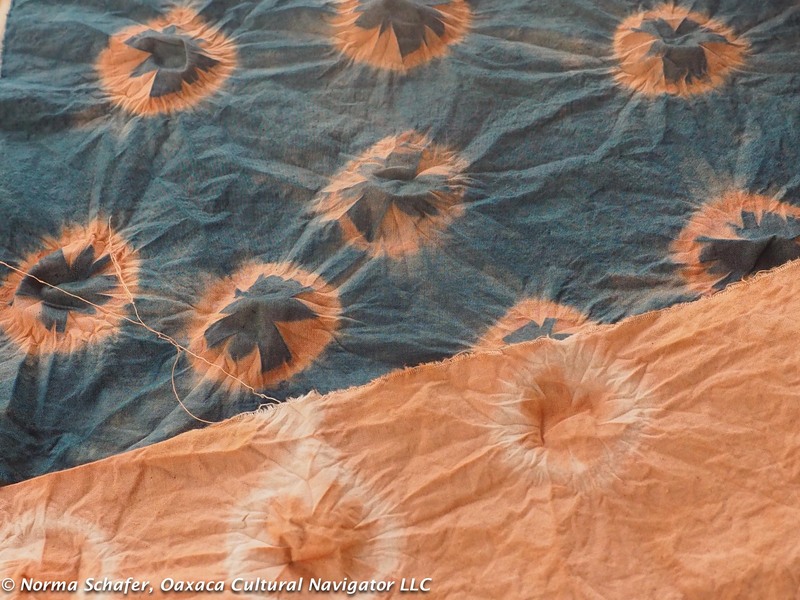 The movement toward using natural dyes is taking hold around the world. It is an environmentally healthy process that is non-toxic and sustainable. 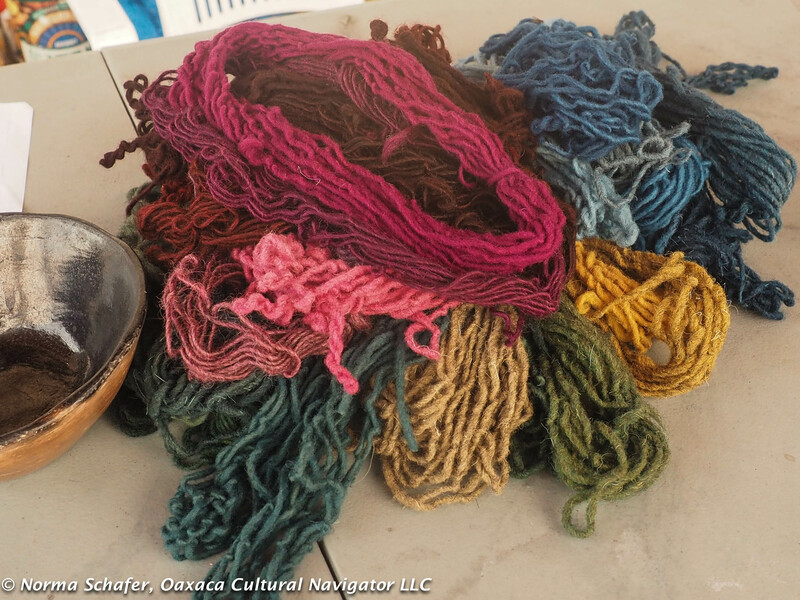 Here in Oaxaca more weavers are using natural dyes for their beauty and because it’s what eco-minded textile lovers want. 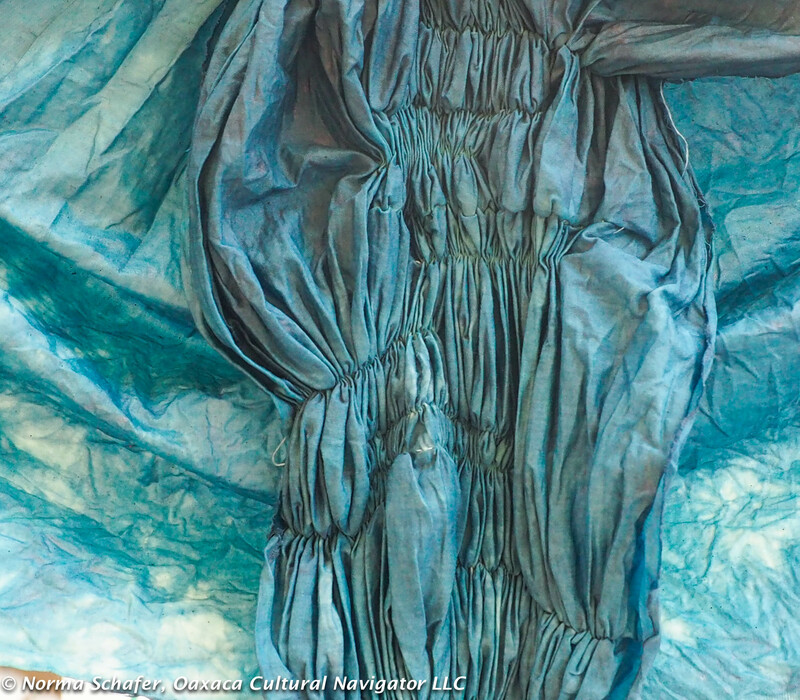 On this last day, we prepare the indigo dye bath to color cotton and wool blue. 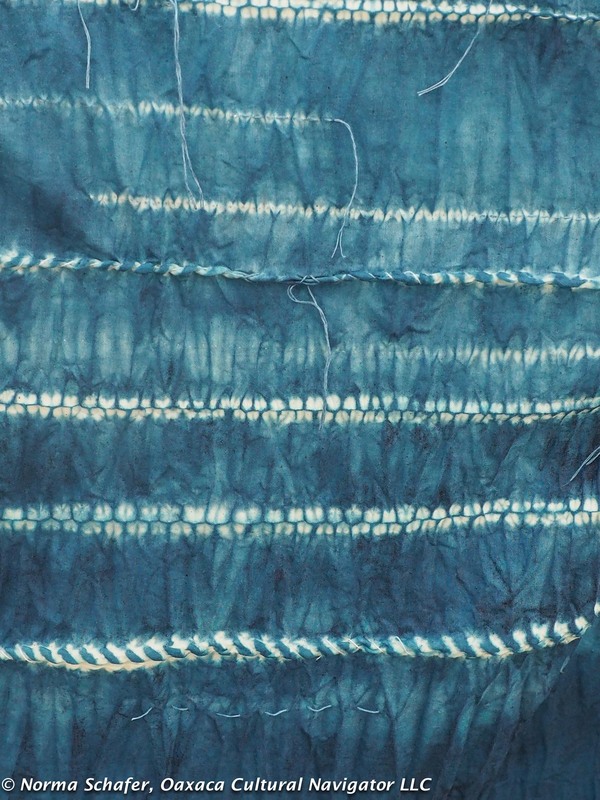 We also use the indigo for overdyeing. This gives us a rainbow of colors. 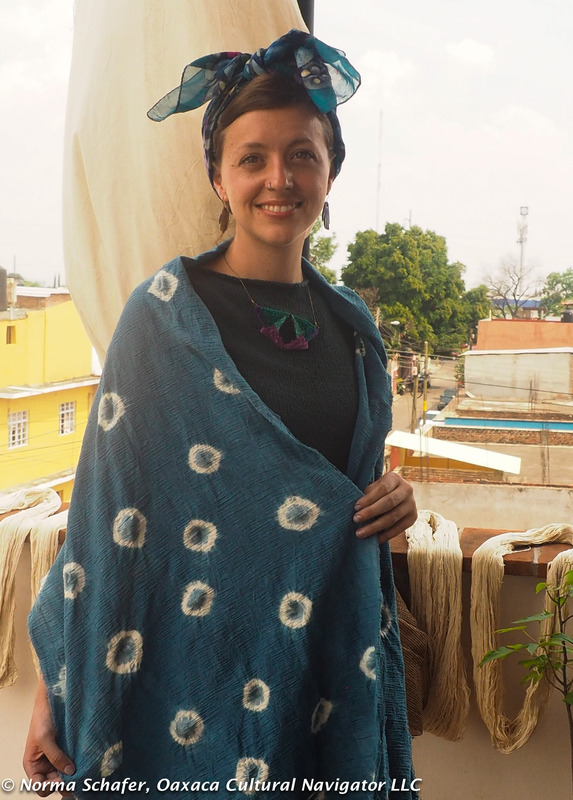 Elsa shows the film about the small village on the southern coast of Oaxaca, Santiago Niltepec, where two families remain who preserve the ancient tradition of growing the indigo plant and making it into dye material. All the indigo that Elsa uses is native to Oaxaca. 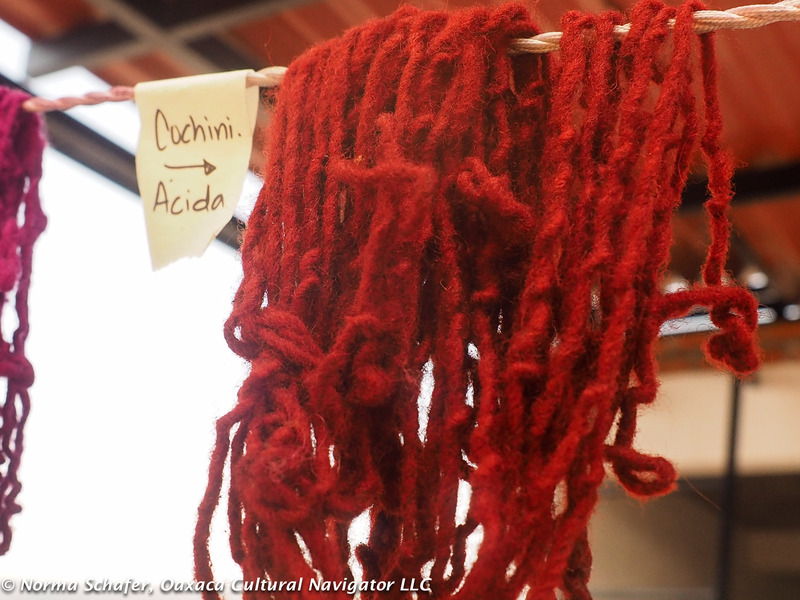 Cochineal gives us red, orange purple and pink depending on the color of the wool, the number of dips in the dye bath, and whether we use an acid or base to modify the color. 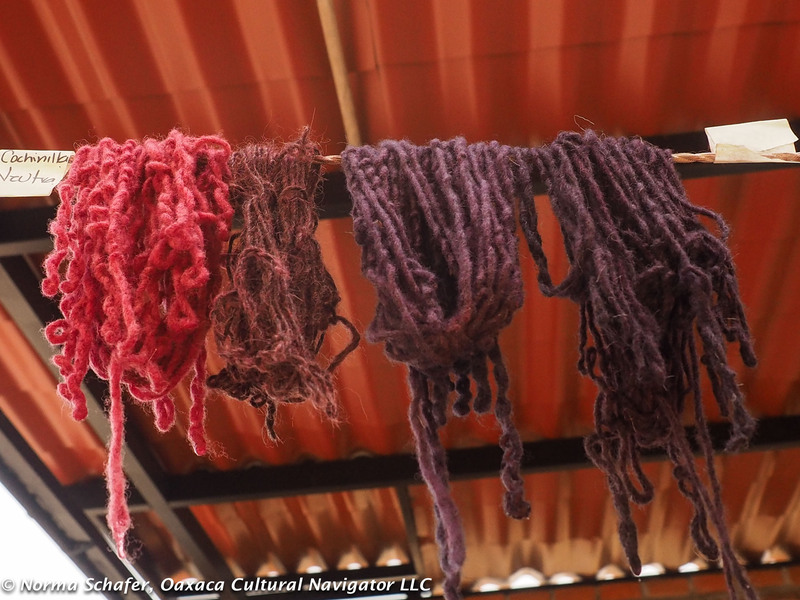 When cochineal is overdyed with indigo, the wool becomes deep purple or lavender or mauve, depending on the strength of the dye bath and the natural wool color. And a memorable learning experience that is both rewarding and fun. 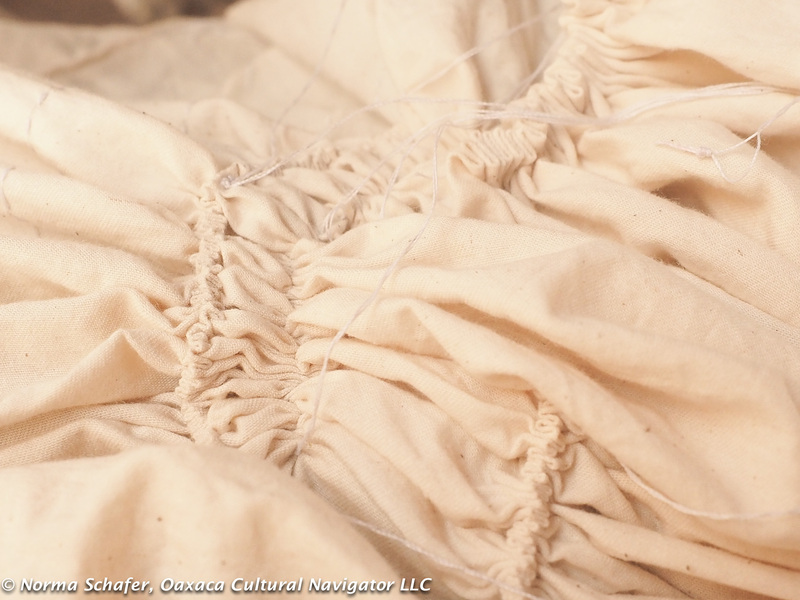 Khadi Oaxaca makes hand-spun organic cotton. Over 100 indigenous women participate in this cooperative located in the Oaxaca mountains halfway between the Oaxaca city and the coast. It takes about three hours to get there. Dress with rolled sleeves and patch pockets. At the winter Museo Textil de Oaxaca expoventa (show and sale), Khadi Oaxaca presented an extensive selection of beautiful clothing — mostly ponchos, quechquemitls, huipils and men’s shirts. Some of the textiles are woven on the back strap loom and others on the counterbalance pedal loom also called a flying shuttle loom. 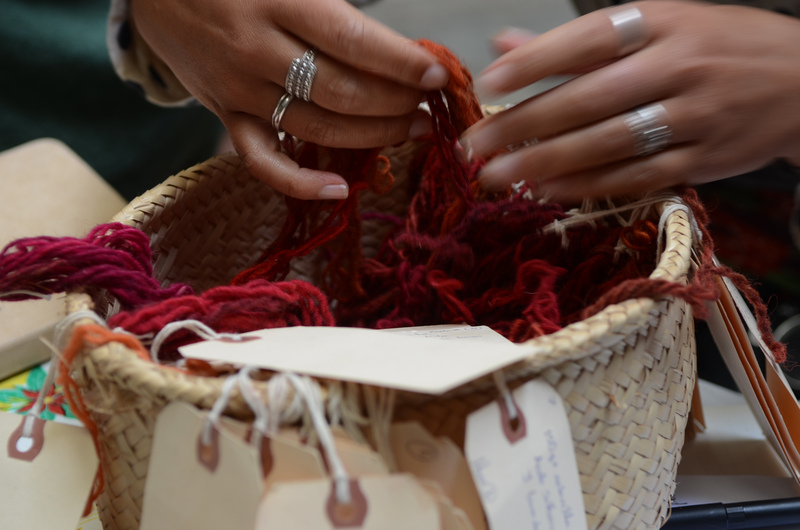 There was lots to choose from, including bolts of beautiful handwoven material. 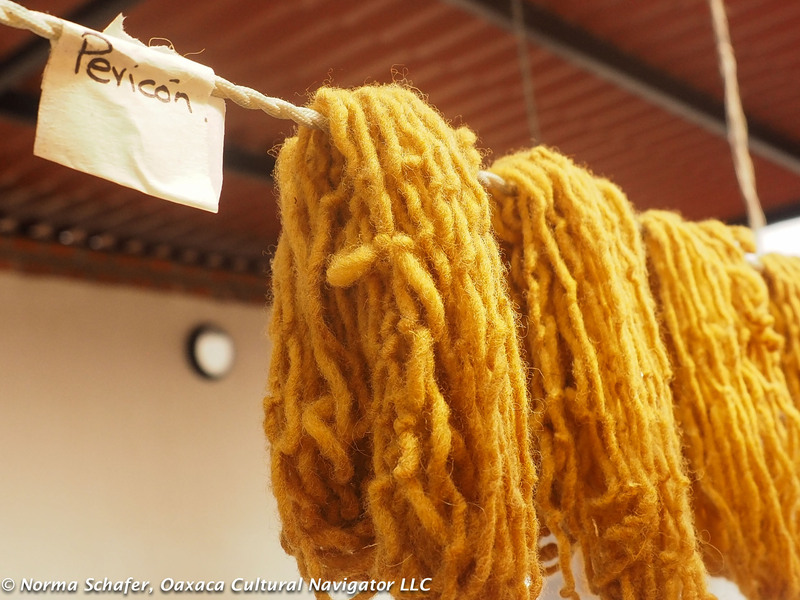 The cotton is dyed with indigo, pericone (wild marigold) and Khadi Oaxaca also harvests and spins coyuchi, a caramel-colored, very soft wild cotton indigenous to Oaxaca and becoming very rare. 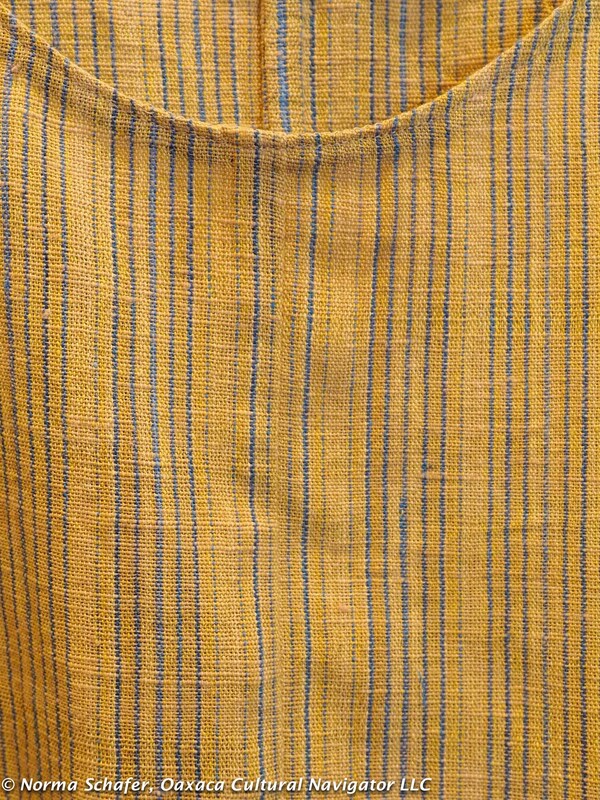 Khadi Oaxaca fabric close up, with neckline detail. Organic handspun cotton: indigo, coyuchi, pericone. I was beside myself and had this urge to sew up a dress using a paper pattern I made from a favorite dress. 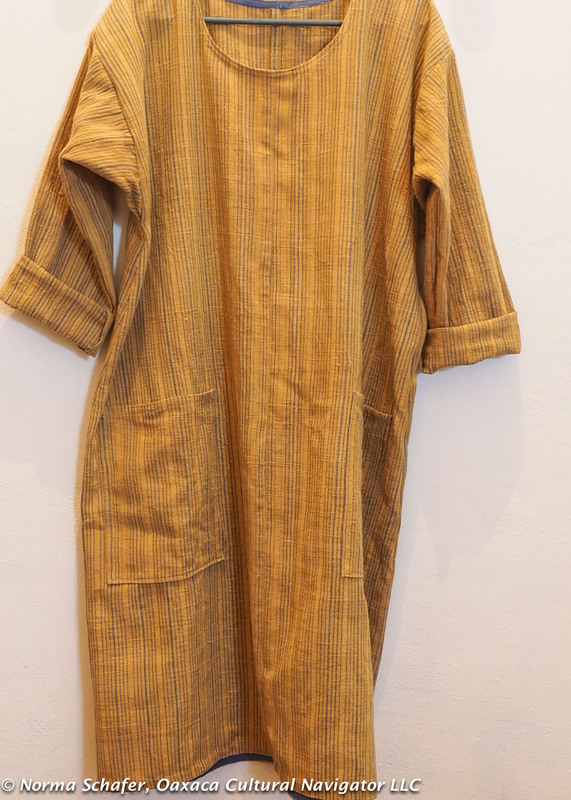 I have made this dress design several times and the Khadi Oaxaca yardage was calling me. 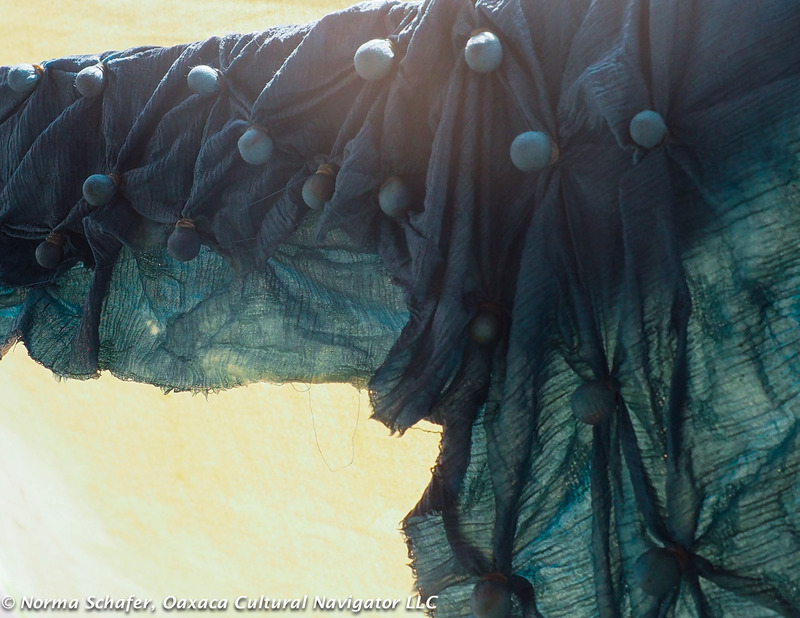 Especially the piece woven with coyuchi, indigo and pericone. We are in Mexico and fabric length is measured in meters, not yards. We measured the dress I was wearing (one of the favorites) and decided I needed four meters, compensating for the fact that the cloth is 15-1/4″ wide. There are 0.914 meters to the yard or 1.093 yards to the meter. Never mind that after cutting out the pattern, I was substantially short! Could I make this dress sleeveless? I think not. 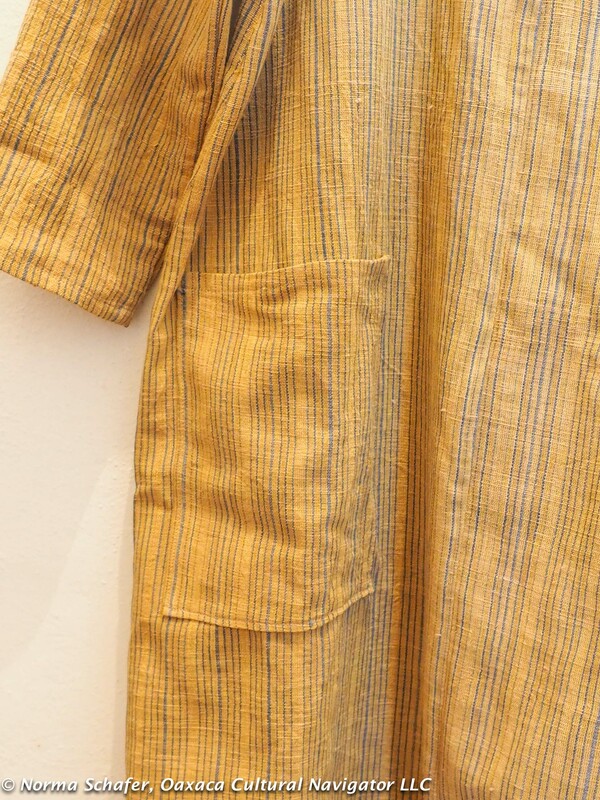 The Museo Textile de Oaxaca has Khadi Oaxaca textile lengths for sale. 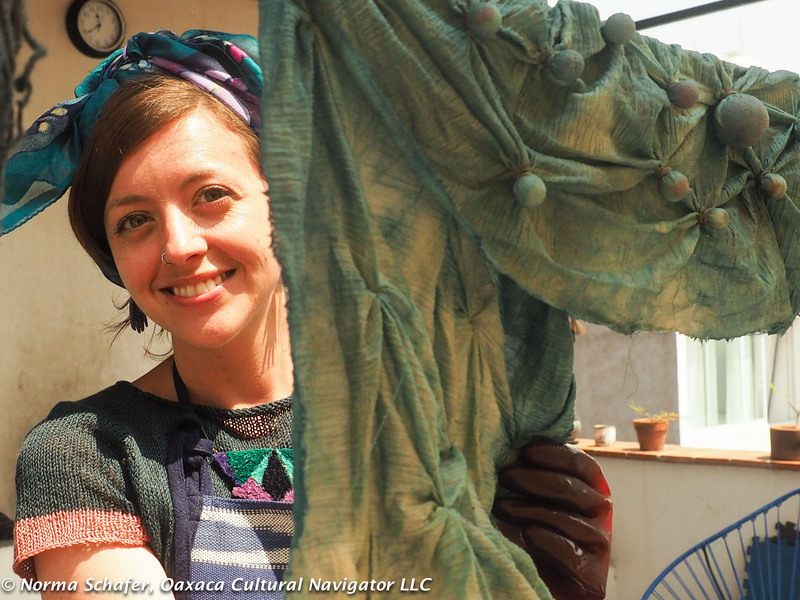 When I sent a message to Khadi Oaxaca, they told me they would bring the meters I needed to museum! Thank you and hallelujah for great customer service. Price: 350 pesos per meter. Patch pockets. French seams! Love the slubs and irregularities of the weave. 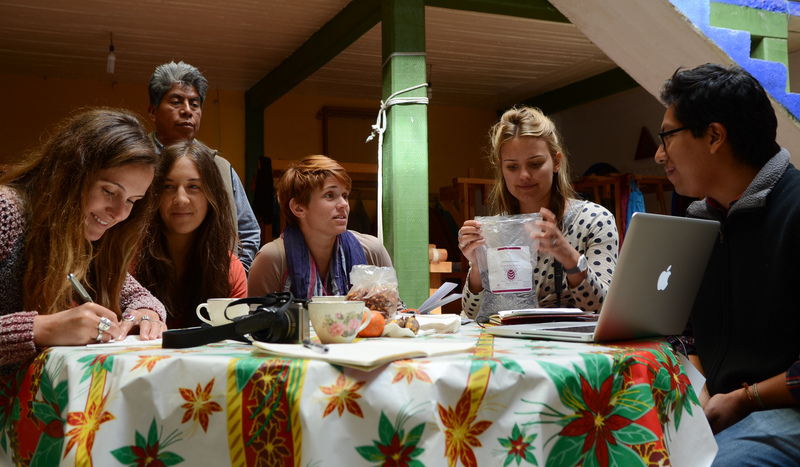 After the intensity of our Oaxaca Women’s Creative Writing and Yoga Retreat last week that I fully participated in, writing about mother, father, family and home, I loved the down-time that this project gave me. I’ll be writing about the retreat in days to come. 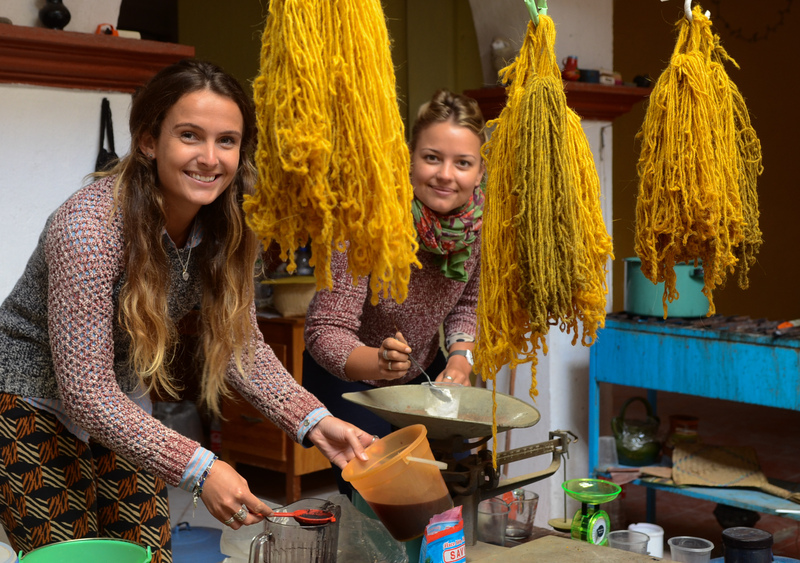 Several months ago Australian home furnishings designer Lauren Bennett contacted me about taking a natural dye workshop in Oaxaca with her business partner Genevieve Fennel. Lifelong friends with a passion for textiles, they started the Sydney-based company Walter G & Co. almost two years ago, importing textiles from India to market a home decor line for resale to designers and shops. 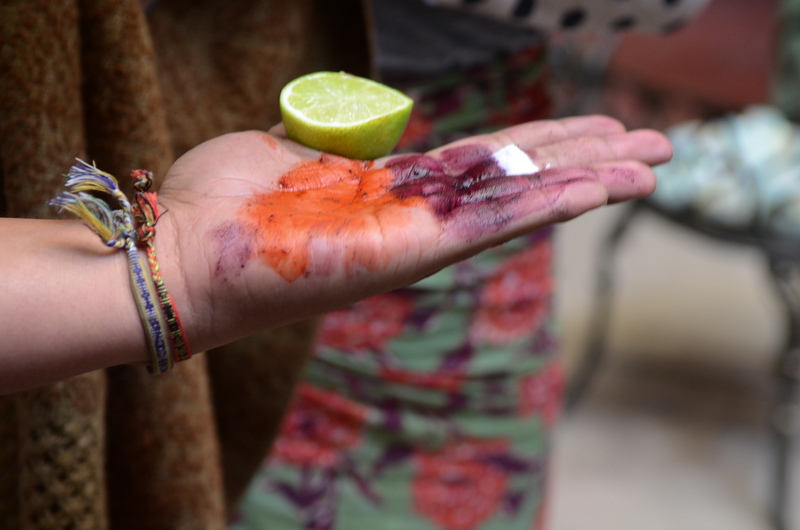 In India they work primarily with Rajasthan artisans who use indigo, saffron and madder dye. 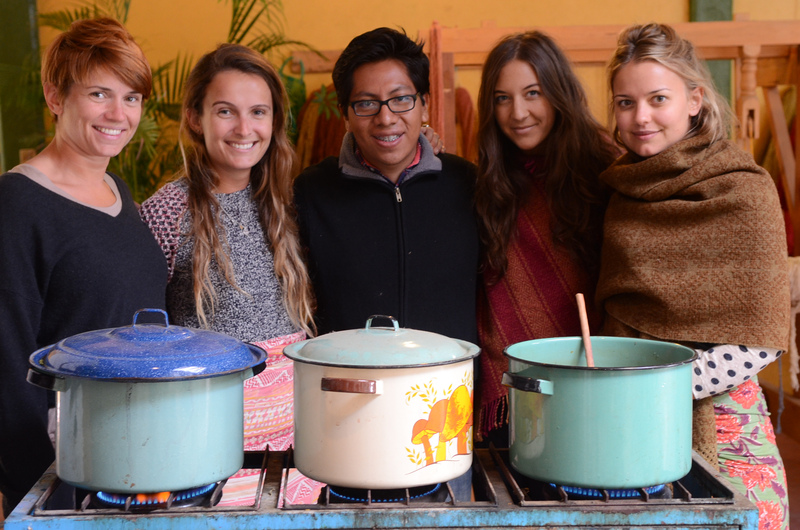 They wanted to learn more about natural dyeing in Oaxaca with indigo, cochineal, and wild marigold, including how to ensure color stability. 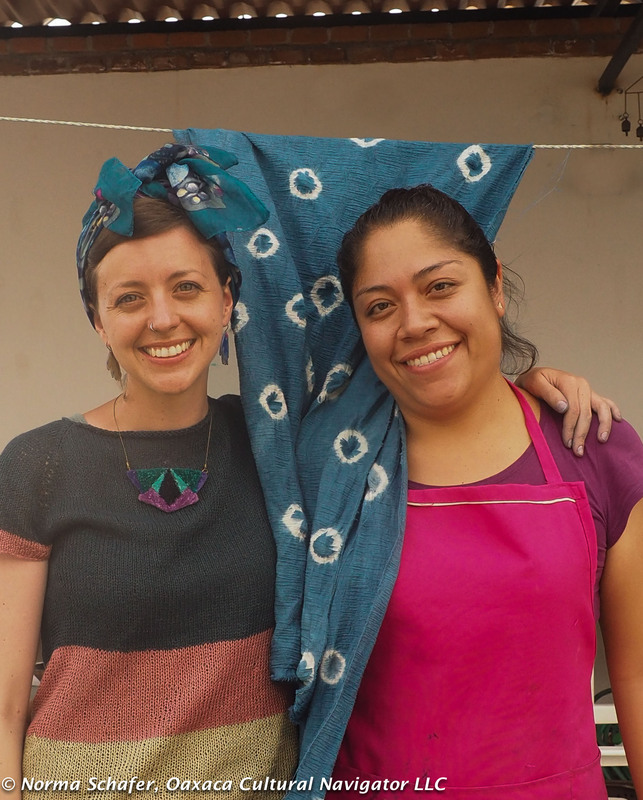 Their goal was to compare techniques and processes between the two regions, become more informed, and better direct their textile business. 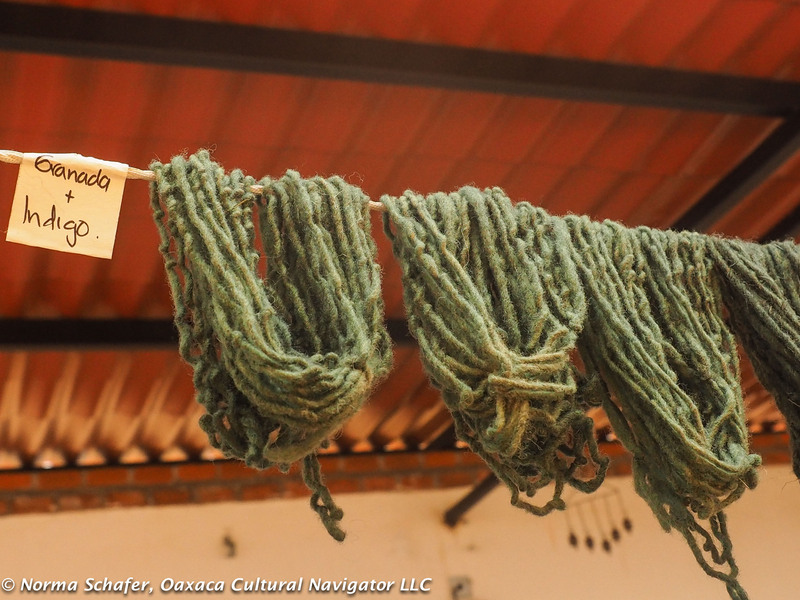 In Oaxaca, there are few more knowledgeable about natural dye chemistry and applications than Eric Chavez Santiago. 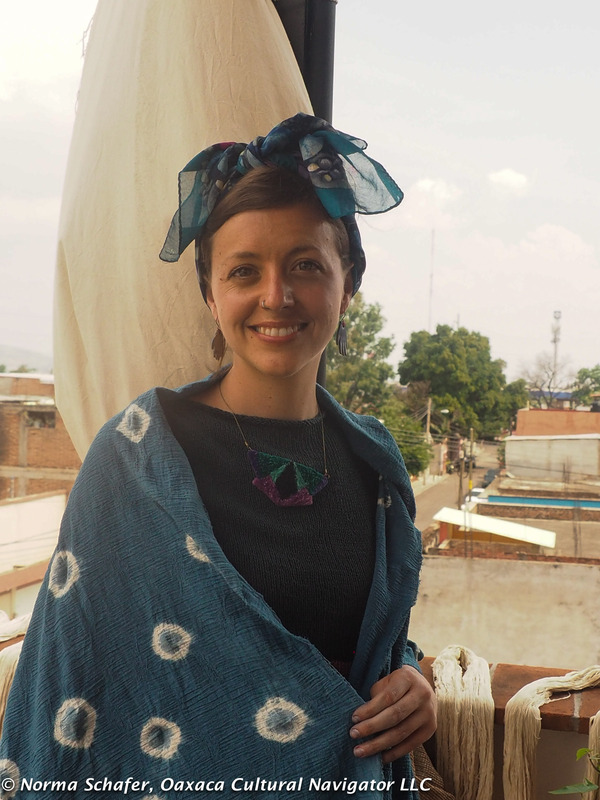 As director of education at the Museo Textil de Oaxaca, Eric works with indigenous artisans to preserve the textile traditions of the state. 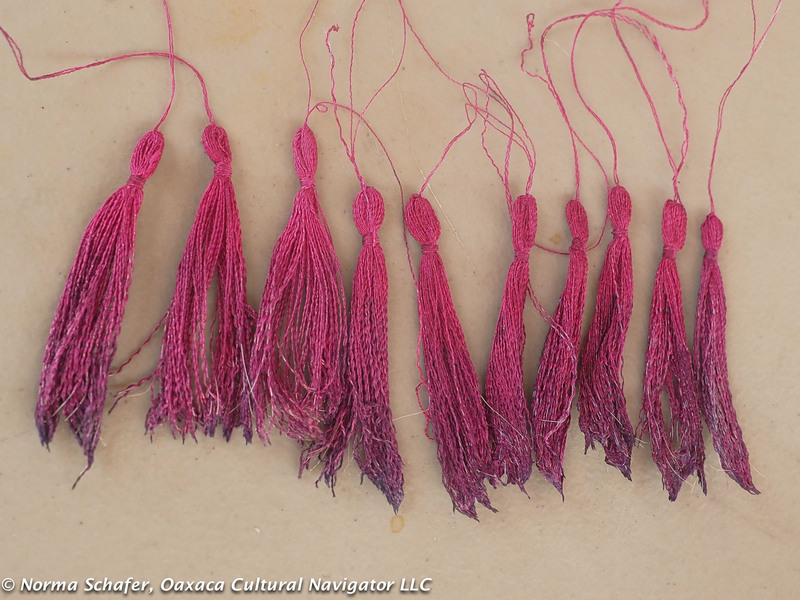 He comes from a family of Zapotec weavers in Teotitlan del Valle, and early in his career developed over 100 recipes for cochineal that his father Federico Chavez Santiago uses to dye the rugs he weaves and sells at Galeria Fe y Lola in Oaxaca city. Lauren and Genevieve arrived this week along with two friends, Lara Zilibowitz and Tempe McMinn. With Eric as their dye master, they rolled up their sleeves and jumped into washing, dyeing and over-dyeing wool skeins over the two days we were together. Eric’s teaching style is both didactic and hands-on. 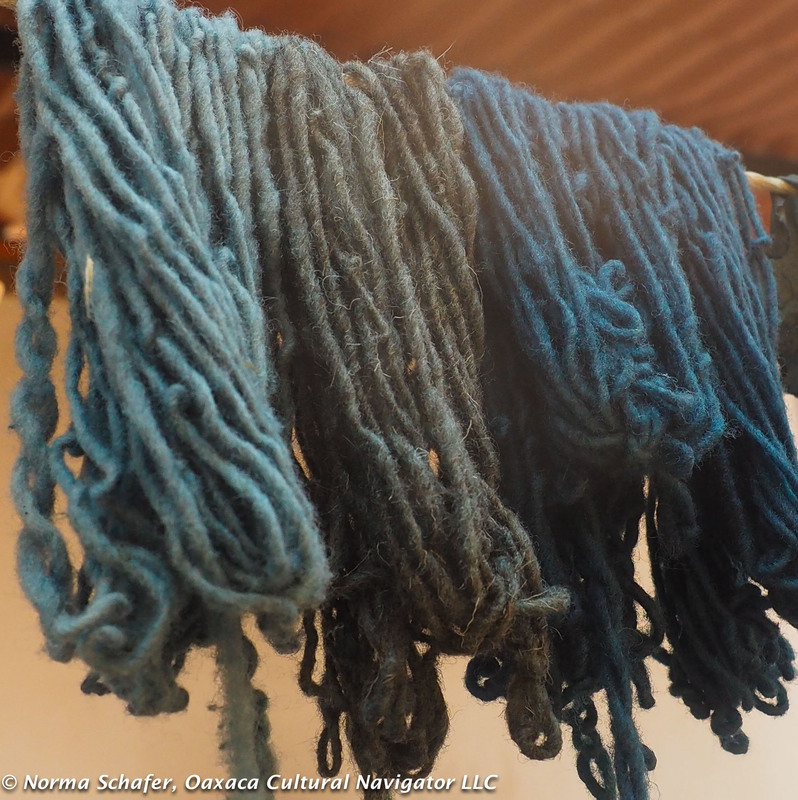 He carefully explained the history of dyeing in Oaxaca, the differences between dyeing with protein (animal) and plant fibers, types of mordant, issues of toxicity, and small batch vs. production work. He showed examples of cochineal recipes he developed that are tagged with proportions. 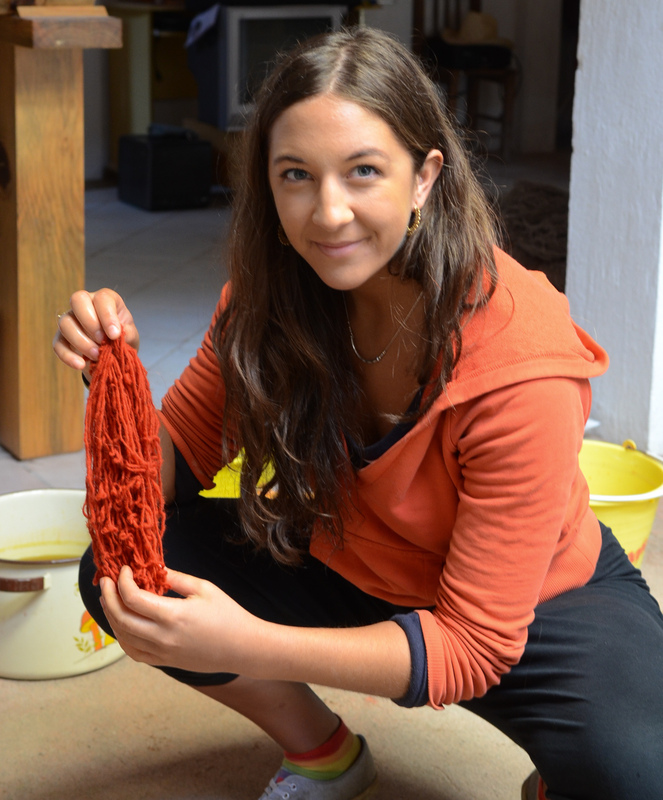 The two-day workshop focused only on dyeing protein fibers like wool, alpaca and silk. 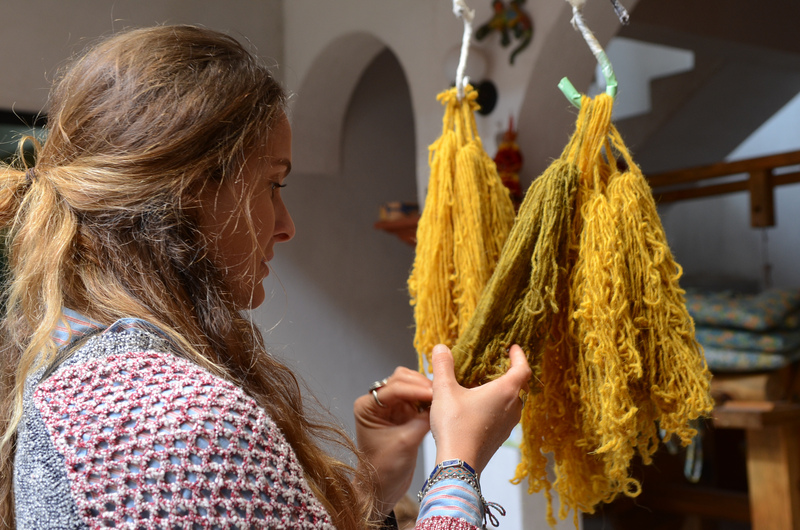 During the first day of the two-day program, we made a 10%, 20% and 70% cochineal dye bath and then did the same for the wild marigold, which is called pericone here. 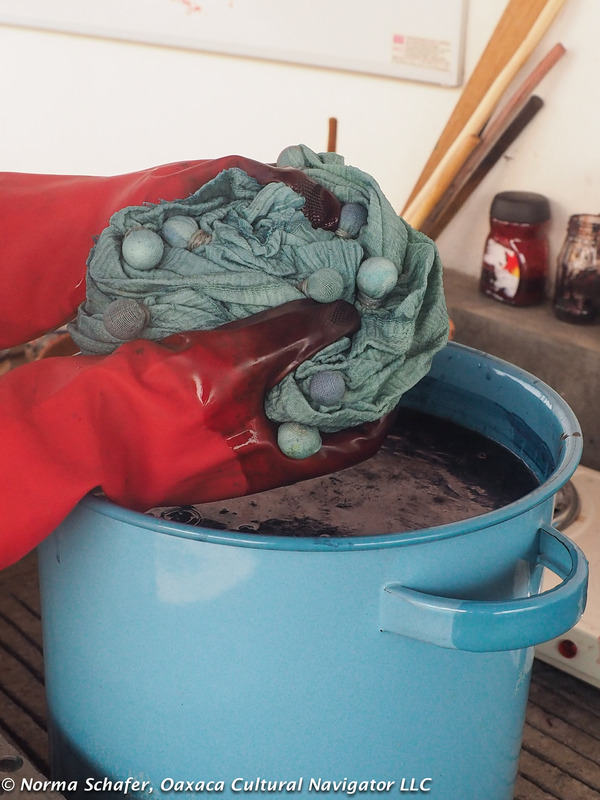 You’ll see more of day two of the workshop when we made a indigo dye bath and our blue hands in a later post! Eric explained how the pH of the dye bath and the temperature of the water are essential for a successful result. 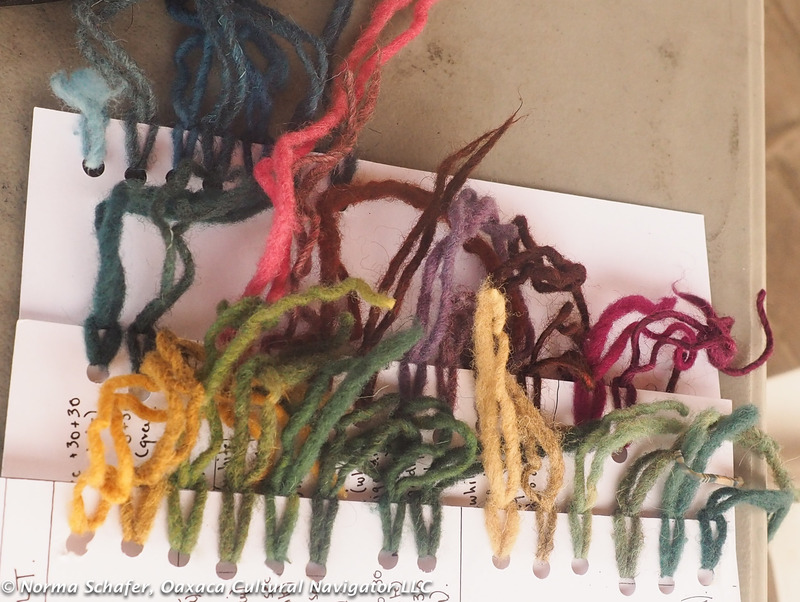 He also demonstrated how the color of the wool influences results. 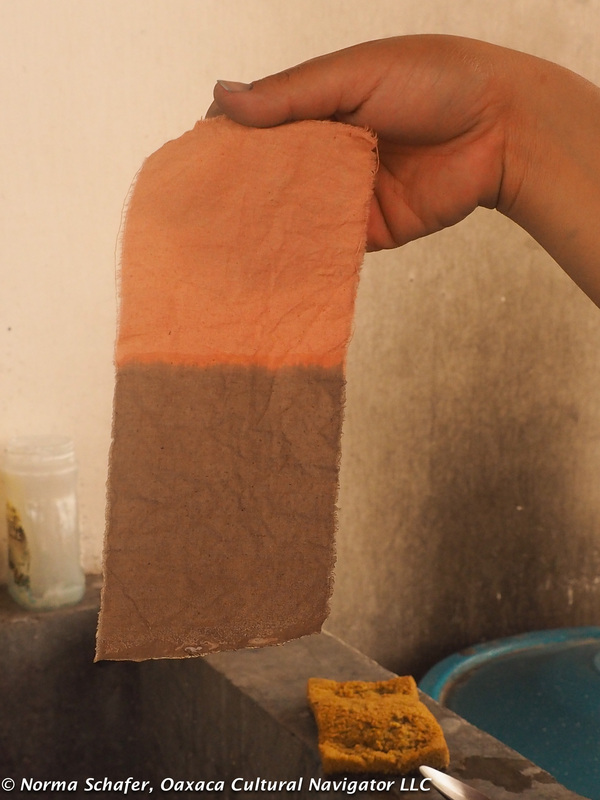 White, beige, gray and brown wool will determine the ultimate color of the fiber when it takes the dye. Eric shared his recipes and we were on our way dyeing skeins that he had mordanted in preparation. Lauren, Genevieve, Lara and Tempe all said that Eric’s explanations and demonstrations are easy to understand and they loved being able to fully participate — hands-on. Plus, they said, he speaks great English, so the learning experience was wonderful. Eric offers a step-by-step approach with intermittent review of concepts so no one is left behind if the chemistry becomes a bit complicated. 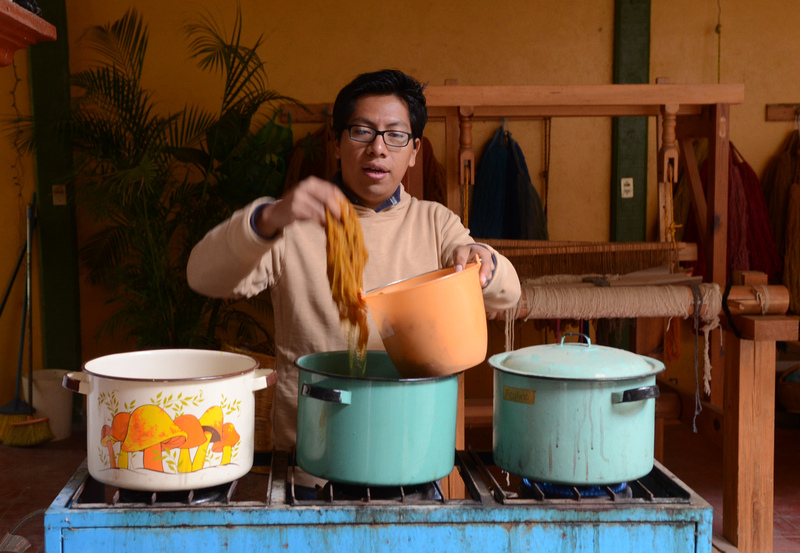 He loves sharing Oaxaca’s dyeing traditions and wants people to be as excited about natural dyeing as he is. Stay tuned! 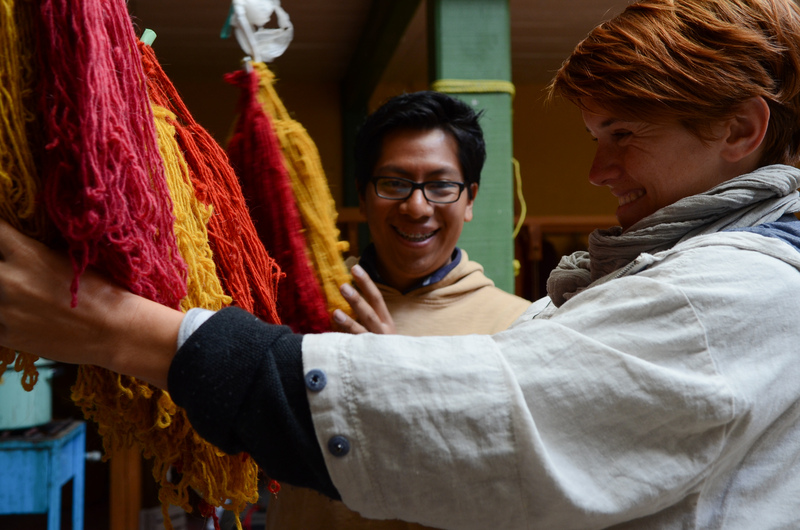 We are planning more dye workshops. If you want a customized workshop especially for a group of people, please let me know and we will try to make it happen! 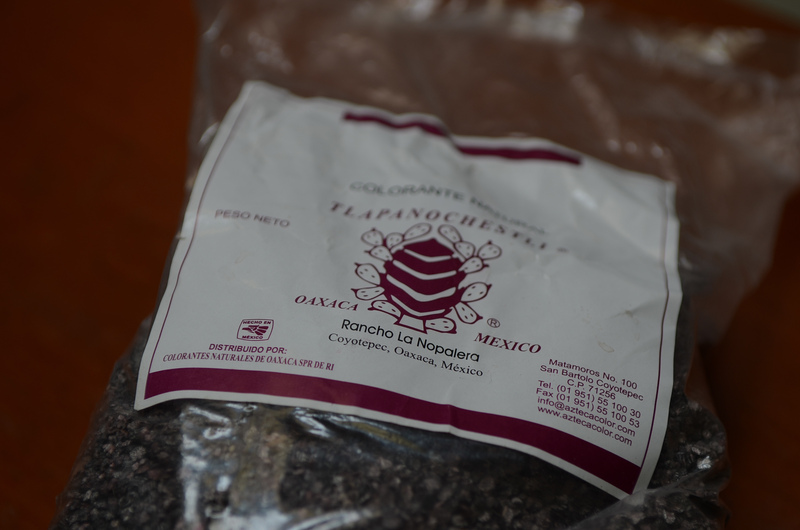 Cochineal is native to Oaxaca and the state of Puebla. It was tribute paid by the Zapotecs to the Aztecs. 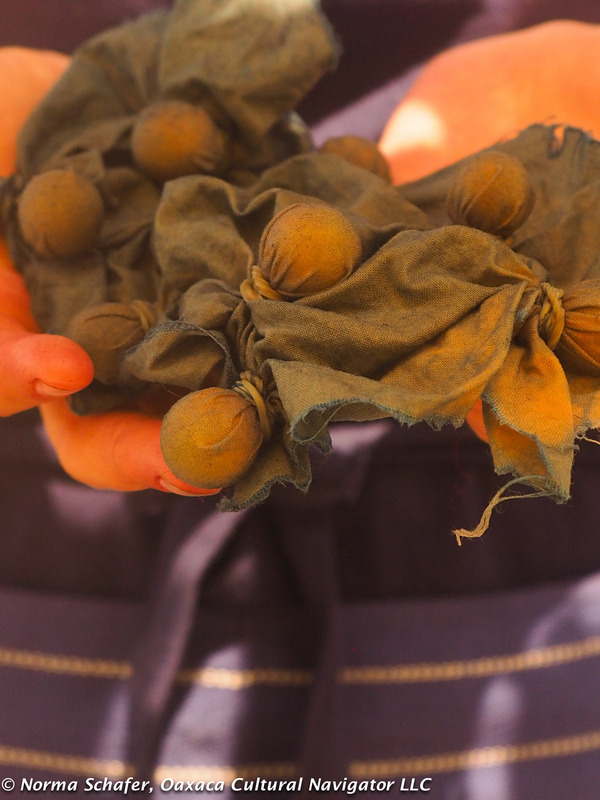 After the conquest, the Spanish took it to Peru, which is now the largest producer of cochineal. 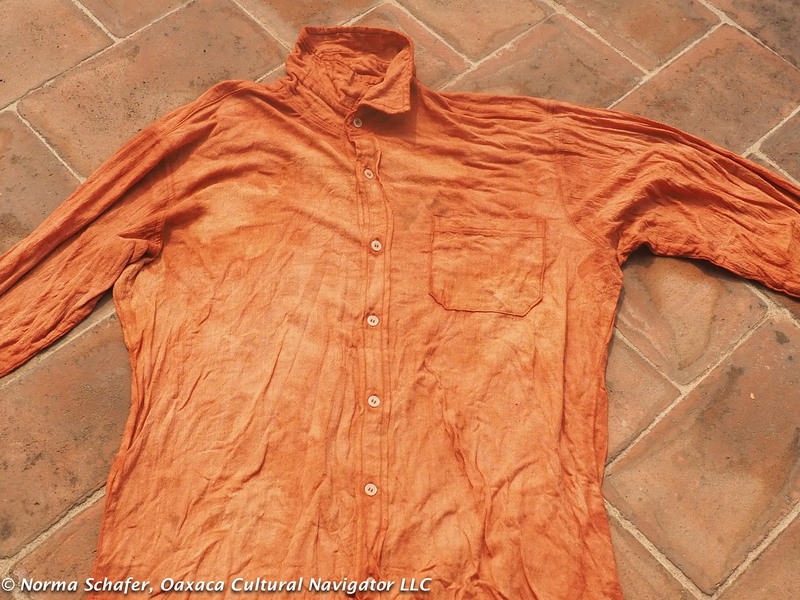 Cochineal is colorfast if mordanted properly. It is very precious and costs about 1,500 pesos for a kilogram of dried bugs — that’s about $60 USD a pound. Yellow is the least stable color to achieve, says Eric. 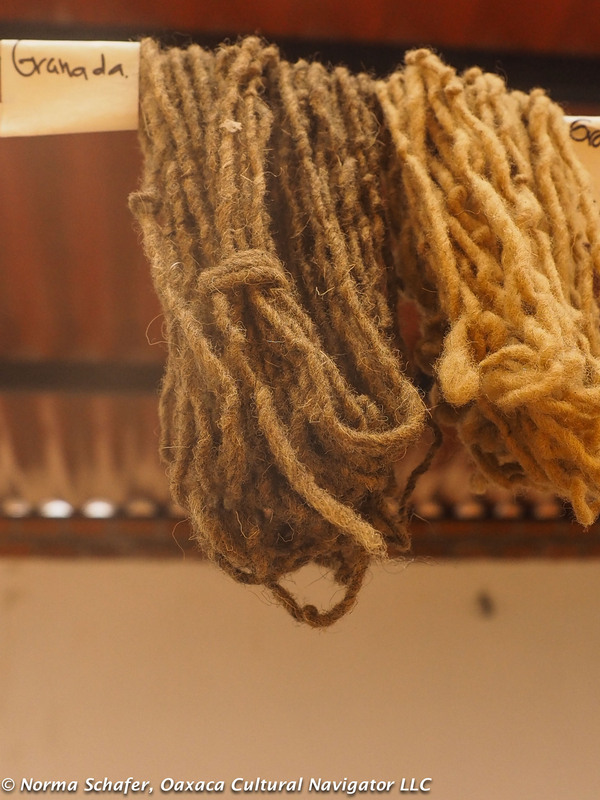 Without proper mordanting, it can degrade the fibers and fade. Wild marigold, native to Oaxaca, yields a strong, stable color. 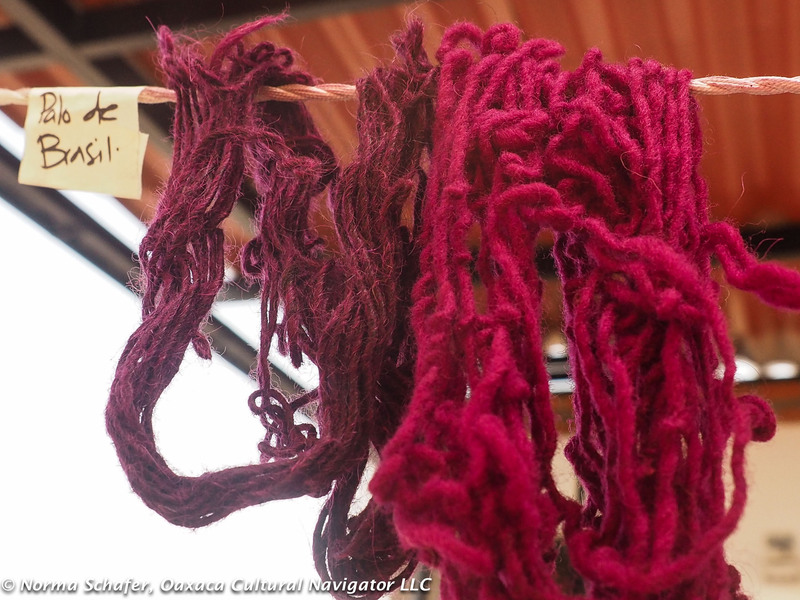 Today, we worked with cochineal and pericone to get about 20 different shades based on the wool color, strength of the dye bath, and the process called overdyeing.